Q: “In light of the whole John Tomic fiasco, would you be able to do a quick primer on the prevalence of parent-coaches in general and how the ATP/WTA view them for those of us that are a little newer to tennis?” -Colin D.
Parent-coaches and involved tennis parents are always going to be part of the sport. After all, the reason so many of these players reached the top levels of tennis was because their parents took interest when they were young. To foster a young tennis talent usually requires dedication and investment from a parent, but sometimes it can turn into a situation where the parent is no longer helping the player as they get older and need better coaching and guidance. It’s important to remember that cases like John Tomic are the exception and not the rule. There’s a big difference between being over-involved and being abusive, and Tomic’s actions are hardly comparable to the vast majority of parents who are involved in their kids’ careers. WTA chief Stacey Allaster spoke about this a few days ago when the Tomic situation came to light. Putting the abusive situations aside, the reaction of the tennis community to a player having a parent as a coach is generally going to depend on the player’s results. If that player is doing well, you won’t hear too many complaints. If the player is struggling? The parent-coach relationship will be scrutinized (see: Caroline Wozniacki). Okay, I’m going to answer this one honestly, though I was tempted to give a non-answer on the overrated question. Right now, I’d have to say that Angelique Kerber is a bit overrated. The World No. 6 has yet to beat a top 10 player in 2013. In fact, the last time she beat a player ranked inside the top 10 was in Cincinnati last year where she beat a lackluster Serena Williams and Petra Kvitova (who can lose to anyone on a bad day). I personally enjoy her game, and I find her extremely entertaining to watch, especially when she’s in SarcastiKerber mode (see Exhibit A below), but she really has struggled against the top players. Other underrated players in my book: Li Na, Stan Wawrinka, and Kei Nishikori. For those who missed it, in her Madrid match against Serena Williams, Anabel Medina Garrigues took the new balls she was given to serve with and rubbed them against her racquet to fluff them up, thus slowing them down. While the WTA told SI.com that Medina Garrigues could’ve been given a code violation by the chair umpire, there doesn’t appear to be a specific rule against this in the WTA handbook. Is it gamesmanship? Yes. Medina Garrigues was using a (seemingly not illegal) tactic to gain an advantage over her opponent, trying to deal with pace of the Williams serve. Should the WTA, ATP, and ITF make a rule against this particular practice? Maybe. And I do think that gamesmanship is fairly common in tennis, to varying degrees. But gamesmanship is common in every sport. The very definition of gamesmanship is “the art or practice of winning games by questionable expedients without actually violating the rules.” As long as the player is not violating a specific WTA rule, it’s hard to see how the WTA could or should punish a player. My own perspective on gamesmanship is this: As a tennis player, you must possess supreme focus. If your opponent is doing something to try and distract you, you must maintain that focus regardless of what’s happening on the other side of the net. Back in my days of being a competitive violinist, I used to practice in noisy environments in order to prepare for the inevitable distractions that could arise during a competition or performance. Yes, it would be unfair if I were competing and a judge’s cell phone went off in the middle of my performance (you’d be surprised, it happened more than you’d think), but I wouldn’t be granted any leeway if that were to throw me off. It was my own responsibility to keep going and ignore the circumstances. The same principle applies to tennis. If your opponent is doing something that annoys you but isn’t against the rules, it’s your responsibility to maintain your concentration. At the end of the day, having a legitimate gripe about gamesmanship is only a moral victory. Winning is more important. As for deterring this kind of thing: if the WTA, ATP, or ITF don’t want a player to fluff up the balls, they should make a rule that forbids it. Q: “How do you think the top-10 of the ATP rankings will look like in 5 years?” –Zézé M.
I would expect to see some of those names in the top 10, alongside some other young players like Kei Nishikori (23), Milos Raonic (22), and Jerzy Janowicz (22). Maybe some of the Big Four will hang on to their spots in the top 10. Djokovic and Murray will be 30 years old at that point, and Rafa will be 31. And just for kicks, Roger will be 36. Hey, you never know. Q: “My question is this – can Wayne Odesnik ever ‘make up’ for his transgression? As it stands, he has ‘served his time’ and yet I get the sense his behaviour will not be forgiven or forgotten by many. There seems to be a feeling that his cheating (although I’m not sure there was evidence he actually cheated, only that he had the means to do so) means he will always be a cheater as in present tense and not past tense. Or as Mrs. Green said to Rachel, ‘once a cheater, always a cheater!’ I would be interested to hear your thoughts on this.” Claire L.
The Odesnik case is an interesting one. The short answer to your question is no; I think for many people, Odesnik’s name will always be associated with his ban for possessing HGH, and he won’t be forgiven, no matter what he does. That’s the case for many athletes who have been implicated in any kind of doping scandal. However, this situation is complicated by the fact that Odesnik was never a popular player on the ATP Tour, and it seems like the negative opinions of his fellow players are shaping some of the narrative, making it harder for Odesnik to return to a semblance of normalcy. Many of them spoke out against Odesnik when he returned after his suspension. Compare to Odesnik the reaction of players in the case of Robert Kendrick, a more popular American who failed a drug test and claimed it was due to taking a pill for jetlag. According to Tennis.com, John McEnroe, Tom Gullikson, John Isner, Robert Ginepri, James Blake, Bobby Reynolds and Michael Russell all supported Kendrick’s efforts to reduce the ban. Though the circumstances were different in the two cases, I do think that if Odesnik had been a member of the American tennis inner circle, the reaction to his return to the ATP Tour would’ve been very different. Stan Wawrinka has been a top 30 player since April of 2008, which makes him pretty remarkably consistent. In that time period, he’s reached a career-high ranking of No. 9 in 2008, and had some ups and downs within that top 30 range. He’s also dealt with some personal issues during that time. The qualities of his game that got him to No. 9 in 2008 are the same ones that have helped him reach the top 10 after his great performance in Madrid this weekend, and it’s good to see him back in vintage form at the age of 28. If there’s one thing I would single out as the key to his recent success, it would be his week-to-week consistency. He’s handled the ATP Tour grind a little better. I also sense some more maturity in the way he’s handled himself. Though he’s faced heartbreaking losses this year, he seems to have taken only the positives from those experiences, and the big wins have started coming. In the past, I would see him lose confidence after tough matches and suffer inexplicable early round losses. Regarding Tsonga, I’ll be honest and say I haven’t seen much of an improvement under Rasheed. His results have been pretty much what I would’ve expected since they’ve been working together. That said, the relationship is still relatively new, so we should give it some time before deciding whether the partnership is successful or not. As far as coaching goes, it’s virtually impossible for tennis observers to know how much of a player’s struggles or successes can be attributed to coaching, especially since we can’t witness the day-to-day interactions between player and coach. A player can succeed in spite of poor coaching, and a player can be inspired by a good coach and reach new heights. I don’t think there’s a great way to tell the difference, unless you’re very close to the situation. I wish there were a better answer than that. Q: “I’m an 18-year-old blogger and I’m planning on covering my first 250 tournament this summer. I’m not gonna lie, I’m nervous, so any advice for someone covering their first tournament?” -Cassie C.
Check out the practice courts for entertainment when there aren’t any interesting matches happening. It’s always enlightening to see how different players prepare for their matches. Also, you get to see the players outside of a formal match setting, so it can be a lot of fun. Go into the tournament knowing that you won’t necessarily get to see everything. You can’t be in three places at once, so just go through the schedule each day and keep in mind which matches you don’t want to miss, and which players you want to make sure you get to speak to. It’ll change on the fly, too, if a match turns out to be a dud, or a match turns out to be more interesting than you expected. It’s okay to go with the flow. Before you go, think of some good big picture or topical questions for the players you want to speak to. That way, you have a few questions already prepared, in addition to whatever questions you have about the match in a post-match interview or press conference. It’s always easier to get time to speak with the players individually earlier in the tournament, because more reporters show up to take in the later rounds. So if you have a player you’d particularly like to speak to, make sure you get your request in early. Q: “Say you know a hockey fan. And they don’t think they’d be all that into tennis. How would you persuade them to give tennis a chance?” -Laura S.
The four Slams are the tennis equivalent to the Stanley Cup Playoffs. They are the pinnacle of the sport, so that’s where the high drama matches happen. But they’re also pretty overwhelming because they start out with 128 players in the draw for both the men and the women, and that’s a lot of matches to keep track of. The first seven or eight days of Slams are chaotic to watch on television. Most channels covering those tournaments will jump from match to match all day, and I don’t think it would be easy to follow if you’re not used to the craziness and don’t know much about the players. So if you’re new to tennis, I would recommend tuning in for the last three or four days of Slams. Once the quarterfinals or semifinals are in progress, you’re down to keeping track of just four or eight players. The commentators will do a decent job of summing up whatever you need to know about rivalries, storylines, etc., and usually the television coverage will stick with one match from start to finish. Once you tune in, just watch the match closely, and I think you’ll immediately figure out whether the sport itself appeals to you. But if it doesn’t, you’re obviously a terrible person. Honestly, I think the only chance for a non-Big Four member to win a Slam in the next couple of years is something a bit fluky. Sometimes you have those weird tournaments where some of the Big Four are upset early (Madrid this year, for example). It doesn’t tend to happen at Slams because the best-of-five format makes those upsets much harder to pull off, but I think it’s still a more likely scenario than what happened in 2009, when Juan Martin del Potro got hot and beat Nadal and Federer on his way to winning the US Open. 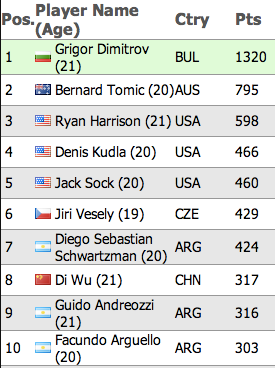 Anyway, it’s pure speculation, but I wouldn’t be shocked to see Del Potro pick up his second Slam or to see Tomas Berdych finally get over that hurdle, perhaps beating only one member of the Big Four along the way. It would take the exact right draw, but I just keep telling myself it has to happen one of these days. Picking Del Potro, who managed to do the impossible and win a Slam in the Big Four era in 2009, and Berdych, who managed to make a Wimbledon final in that same era, seems like the safest choice. I think theres a good chance of a non Top 4 winner in the next couple of years. Federer is almost 32 + back issues. I think his slam QF streak will end soon. Nadal has knee issues and I think he has one year left in his prime. Well see if hes still a significant threat for hardcourt slams (yes, hes won Indian Wells, but best of five is a whole other ball game considering his knees). Murray isnt an elite clay court player, he had one semifinal in Roland Garros primarily due to a lucky draw. Hes also the only one of the Top 4 whos vulnerable to Ferrer. Djokovic.. well, with his insane consistency, I really only see him losing to one of the Top 4. Theres a possibility of an injury, because of his punishing style. But there is a chance. It could be that someone like del Potro or Berdych, or Tsonga would only have to beat 1 of the Top 4 to win a slam. Because the other 3 were eliminated early, or because two were eliminated early and two met each other in a semifinal. Now doesnt that sound like a reasonable scenario? Really? Who is the guy who lost to Dimitrov and Haas and Delpo in three out of his last four tournaments? I was talking about slams. So I meant only losing to the Top 4 in slams. Tennis would be more much enjoyable to watch if the umpires would actually do their job. Call hindrance for every wannabe Octomom popping out her fifth baby. Sharapova says she’s been grunting all her life and can’t stop it but her “Madrid” sound was quite different than anything we ever heard from hear. It was even delayed, which is pure gamesmanship. Nice answers, by the way. Still, in another ATP vs WTA war, Djokovic’s outburst was barely reported by any journalist. You can only imagine the comments on websites such as the Daily Mail had Serena said something similar. For a website that sells itself as very pro-WTA, I kinda expected to you touch on that double standard. Nevermind the last part as I’ve just listened to the podcast. Please, Amy, tell me you’re a flyers fan. Also, I enjoy these posts. Keep up the good work. Definitely a Flyers fan! And thanks for the kind words! Regarding the subject of overrated/underrated, I’m wondering how you define that. Is it based on their ranking vs. achievement or based on the popularity? For Gasquet, you mentioned he’s being under the radar, so is it like media attention? For those you listed as underrated, I would like to hear, more in details, why you think they are. Especially if this is related to media attention, I’m very interested to know why certain writers avoid even mention about certain player(s)… Thanks. Thanks for the answer and good job, as usual! :) Great idea to write this column, it feels fresh the way you’ve done it so congrats!